i turned the machine on and all good - the lights came on after a few minutes of warming up. tried the steam wand - nothing. Cleaned the wand using the pin supplied and all good. tried running water through the machine without the group head but nothing came pout. Water was coming out around the top of the machine and leaking out of the top of the machine. Quickly turned it off. tried to get water out of the hot water side - water trickled out of the spout but also out of the top of the machine again. Removed the shower screens - they were blocked and full of 'gunk'. Cleaned and replaced tried again but still leaking all-around the unit. Tried to descale the unit using Vinegar and water but im not sure if the water is going through the unit so not exactly sure if this has done much although it did seem to come through better / quicker? Side note - when i turn the machine on after a few seconds water drips form the top of the machine. then stops. 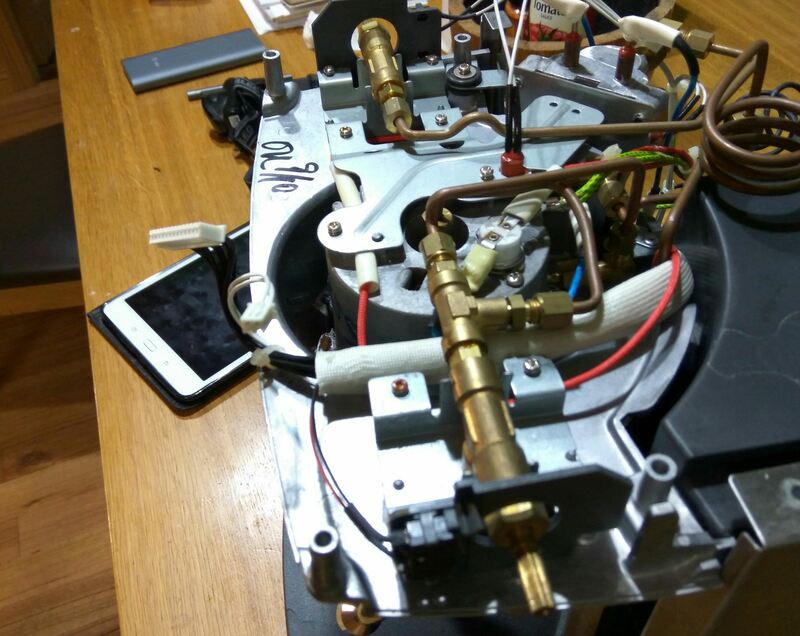 I have one that has broken the input to the brew thermoblock. Thanks for the quick reply - Does that have the same symptoms ie leaking water from the roof of the machine? I kinda guess it would. [IMG] [/IMG][IMG] [/IMG][IMG] [/IMG]I think i have found the issue. 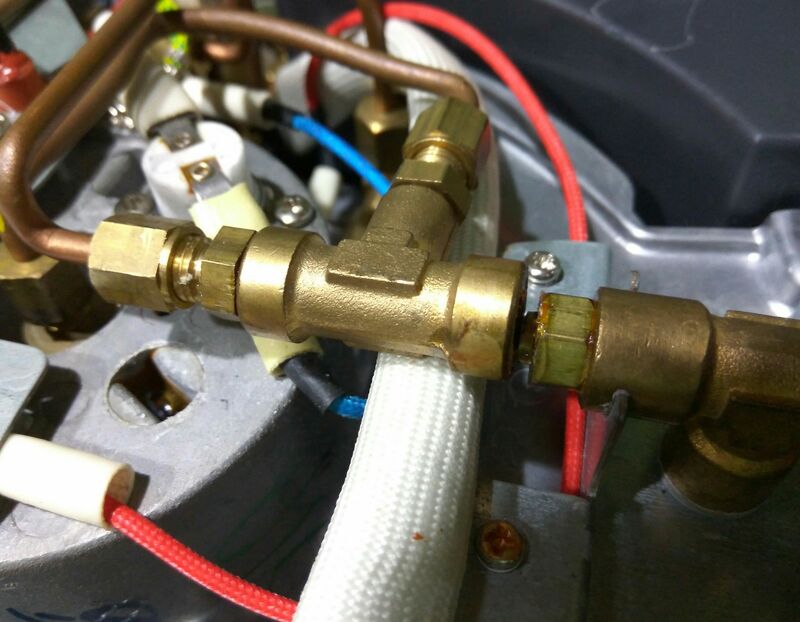 The top t valve has broken away from the hot water valve. Dont think i will need the hot water so might try and block the three way valve into a 2way. Is there a way to add pics? Not sure how to post a picture - such a newbie.... but the threaded bolt (number 14 on page 8 of 21 of the EM6910 Parts Manual) has come apart. 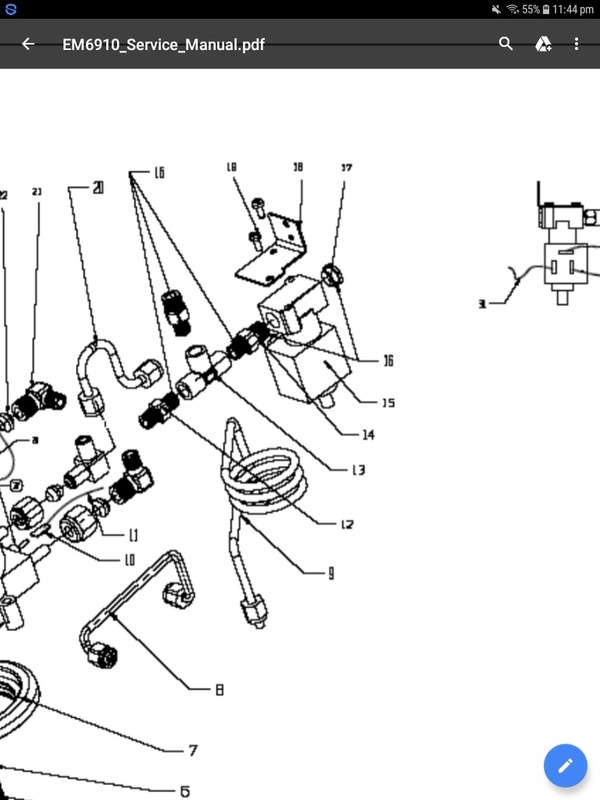 I cant seem to be able to get the part number from the listing as when i blow it up enough to see it gets unreadable. It looks something like C29-1129. Any ideas where i can buy one from - im located in Melbourne. Strange place for a breakage. Those fittings are loctited in there permanently, they'll snap if you try and unscrew them. Someone might have tried previously. Easiest solution is to salvage the complete fitting from another machine. A few guys on here have spare EM6910's and may be able to assist. 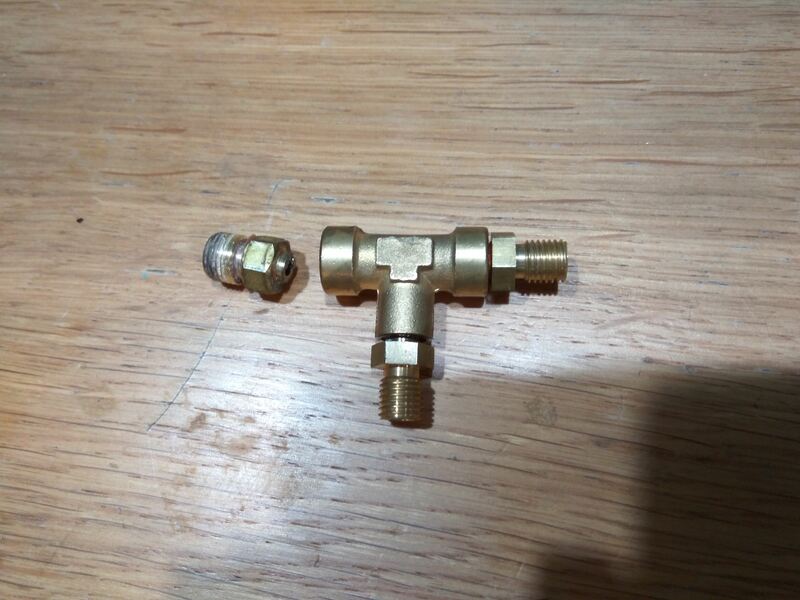 Alternatively, braze over the damaged part of that fitting if as you mentioned you won't be using the hot water. Give me a yell if you cant get one on your side of the island. Im in perth and will have one. Hi Jackster i think i will try and get the double threaded bolt that has broken. Not sue if you have one? Not sure if it has a standard thread or if one side is right hand thread and one side left hand thread. If i can find one, it is listed in the manual but i cant make out the part number, i wouldn't have thought itvwould be too expensive. Possibly a standard socket. Ask at local hydraulics place. Will be cheaper than postage. Heat it to soften the loctite. Didnt even think about a hydraulic fitting doh!!! There's a place near work i can try. Im going to try and get the snapped bit out when im at work as i have access to more tools thanks so much with your help on this one ill let you know how it goes. Last edited by DoubleShotNoSugar; 8th March 2018 at 03:29 PM. Xanthine and Jackster like this.